I took a long time to read this book. It occurs to me that maybe this is not a bad thing. While it might have been nice to read it much faster, and I might have been able to absorb more if I'd read it more than two pages at a time, it still worked. That is to say, I didn't have a lot of time for reading this past month, and so it was good that I could put down this book and walk away and then pick it back up either minutes or days later and not really miss too much. It is indeed a short history. Armstrong covers human myth from prehistory to contemporary times in less than 200 pages, and this causes some difficulties. Particularly in the early part of the book, Armstrong makes some claims and wild generalizations that I found too broad to be easily swallowed, and sometimes she offers no references or arguments to support her statement. The most egregious example of this would be when Armstrong suggests that the brutal, demanding, bloodthirsty "Great Goddess" persona likely dating back to many paleolithic myths was born of male resentment ("Why should a goddess have become so dominant in an aggressively male society? This may be due to an unconscious resentment of the female." pg39.) Maybe so, and maybe there is lots of data to back this up elsewhere, but a claim like that ought not be offhand and unsupported if you expect me to take it, or anything you're saying, seriously. I'm a lay reader, not particularly versed in human culture in paleolithic times. In a couple of cases, Armstrong's claims about people and cultures in the Paleolithic and Neolithic Ages seemed over simplified and under supported, which made those sections of the book rather frustrating. That said, she did say it was a short history, so I forged on, thinking perhaps that I should get a more in depth history sometime. Something I would likely have to read more than two pages at a time. I'm glad I kept reading, because Armstrong does a good job with the ages post-Neolithic, or maybe that's just because I do have a little more background knowledge. And her final, overarching argument, however brief (as befits the book) was convincing enough to be unsettling. She makes a strong case for myth as primitive psychology, for myth as a way humans have made sense of the big questions and the angst of being humans in a big, scary, uncontrollable world. In conjunction with a belief system and ritual, myth becomes the internalized way we deal with our deep fears and insecurities. Myth and its accompanying rituals help humans face death, destruction, change, and our insignificant place in the world. Finally, Armstrong argues that with the onset of humans privileging science and technology over our collective myths, and refusing to identify anything that cannot be objectively proven "true" as valuable in our understanding of the world, we have lost our connection to the deeper things that make us human. By discounting myth as "just a myth" we have lost an integral part of what allows us as individuals and societies to cope with the unknown and the unknowable. We become disconnected and disillusioned, and Armstrong argues that Western society has sunk into a general malaise due in large part to our inability to understand and to value a collective mythology. She is not necessarily arguing for religion here -- she points out flaws in that structure, though also clearly believes it has value -- but for literatures and arts that get at the deeper, universal truths of being human, that can become transformative experiences for contemporary people and societies. I don't necessarily think it's quite so simple, but I do think that Armstrong's arguments -- for the purposes of myth, and for the hazards of losing it -- make a great deal of sense. Her suggestion that literature and the arts are part of our deeper psychological sense-making, and therefore hold an incredibly and increasingly important position in contemporary, myth-less lives, is also agreeable to this reader. 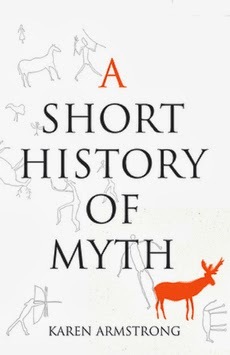 As an introduction to the Myths Series (including Atwood's The Penelopiad, Jeanette Winterson's Weight, and A.S. Byatt's Ragnarok) A Brief History of Myth does an excellent job of making a case for why the series should exist. This book is not without its bumps, but it does what it advertises. If you're looking for meat, go elsewhere, but if you're looking for a lighter primer on myth and its functions, this is a good start, mostly well-written and enjoyable.